NEW! A non-fiction book for middle school. Read it to see that scientists are not dry lab people. They can be adventurers or explorers! They can decide the science they studied is not as fun as a different science – so they do that one instead. 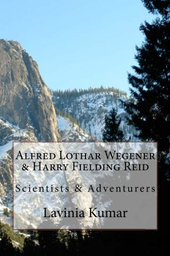 Alfred Lothar Wegener & Harry Fielding Reid: Scientists and Adventurers had at least four characteristics in common. First, they were trained scientists: Wegener in astrology, Reid in physics. Second, they were interested in a different science: both liked glaciers and geology, and Wegener studied weather, and Reid earthquakes and tsunamis. Third, each developed a new theory: Wegener thought of continental drift, and Reid elastic rebound. Fourth, they were not just scientists – they were adventurers, Wegener went several times to Greenland (and died there), and Reid went to San Francisco, Puerto Rico and other places. 7th grade reading level. Buy for Kindle/Ipad, and on Amazon. Maud Leonora Menten, MD and PhD was a very successful woman Canadian scientist and physician. Her name is known primarily for something she accomplished very early in her career, in collaboration with her mentor: the Michaelis-Menten Equation. However, she had a very long and successful career in many research areas, both in medically related fields, primarily in Pittsburgh, PA. But don’t think she stayed the whole time in labs or hospital rooms – she also liked to paint, to hike up mountains, and drive her old car. This book includes a timeline of other events and discoveries during Menten’s long lifetime, and special descriptions of scientific terms, such as catalyst, enzyme, equations for the body, pathology, and more. Students from 7th – 9th grade can learn about an important scientist who has not received the attention she deserves. Find this book on Amazon and on your Kindle/Ipad.